Obedient. Discipline. Content. Kind. Joyful. Loving. Forgive. Patient. These are all words we use regularly with our 1 1/2 and 3 year old daughters. You may notice 2 things about this set of words (which are just a few of the many of this kind that we use). 1) They are words you will find in the Bible. 2) They aren't typical words that you think of small children using. Not only do we say these words to our children, they respond to them and use the words themselves. A long time ago, I got a little grief about using words like this. Not in an offensive way but just in a questioning way. The person was asking me why I was asking my daughter to be obedient and said "why don't you just tell her to listen? She would understand that better." To that specific question, the answer is that I was asking her to do more than just listen. I was asking her to listen to what I was saying, and then choose to comply with what I was telling her. That's a lot bigger than just listening. As far as her understanding it better, both of my children could understand the word 'obey' at a young age. Simply because we put it in their vocabulary. Just as a child would have to learn the word 'listen' and what it means, they had to learn the word 'obey' and what it means. It's all about teaching them and modeling for them! I truly believe that it is just a societal expectation that we talk to our children in simple terms and phrases. Not that I never do that-there are many things that I bring down to a level that they can understand, but I also think it is important that they are hearing Biblical words from a young age. One of the biggest reasons my husband and I feel this way is because they can relate these words to scripture. For example, this is a very common conversation in our household. Me: Sweetie, can you please be obedient and do what Mommy asked you to do? 3 yo: Why? Me: Why do you need to obey? 3 yo: Because the Bible says to. Me: It does! What does Colossians 3:20 say? 3 yo: "Obey your parents in everything, for this pleases the Lord". Me: Yes! It pleases God and makes Him happy when you choose to obey! Boom. Spiritual lesson. Seriously though, it opens up the door for conversations like this. Sure, I could still say that it's important to listen because that pleases God and He wants her to, but when I use the word obey, she can see that the Bible says the same thing that I am saying. In a little toddler mind, the consistency makes perfect sense. It is important to use that our kids know that we are being consistent with God's word. That we are asking of them the same things that God is asking of them. And of us! It's the same kind of thing with forgiveness. We have all learned really good lessons in our home about forgiveness. It's so easy to just brush off an offense and say "it's ok", and not really mean it. And sometimes, it isn't ok. What happened wasn't ok, but you can forgive them for their action. We have taught our children to say "I forgive you" when someone apologizes, instead of saying "it's ok", and it has been really, really good. Even for us adults. It is a lesson I have to consistently learn. But at these young ages, my kids are already getting the opportunity to forgive other people for wrong doings and that is really cool! We don't have a specific scripture that we have memorized with them on forgiveness, but now I want to find one! I love being able to use real life experiences to relate back to scripture and show our kids what things are important to God . 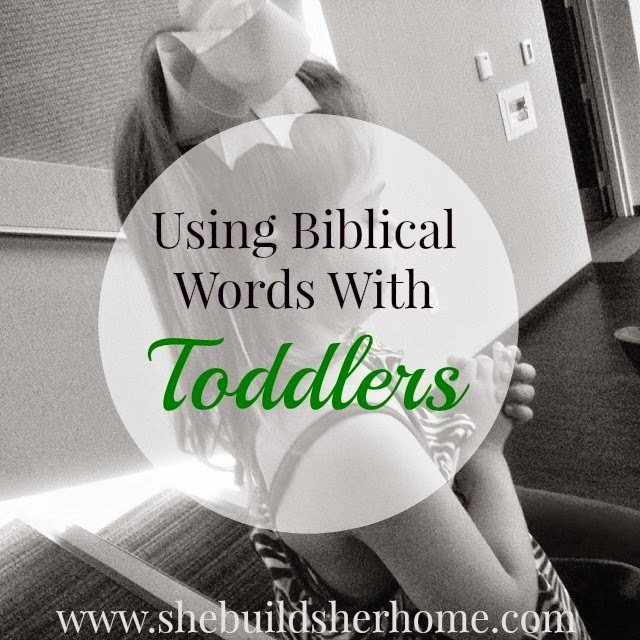 What Biblical words do you use with your children, if any? Have you ever considered replacing words in your vocabulary with words from Scripture? This is awesome!! I need to start incorporating scriptures into Makayla's life more. This is a great way to do that! I really appreciated this post, Natalie! We strive to do this too, but I think it comes more from us both being raised in Christian homes and the fact that WE grew up hearing those words. I like your defense for it, and I particularly liked what you said about forgiveness!